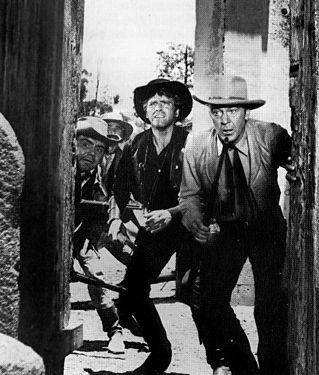 Burt Lancaster and Gary Cooper (with Ernest Borgnine on the left) in Vera Cruz. If you're looking for antecedents of the Spaghetti Western, look no further than Vera Cruz. A tale of macho one-upmanship where Burt Lancaster and Gary Cooper face-off over a $3 million gold shipment, Vera Cruz (1954) deals out double-crosses with extreme gusto. From their first scene together, where Cooper buys a horse from Lancaster--which turns out to have been stolen from a Spanish solider--they become tied together by a desire to prove themselves superior. Their lust for gold further links them in an uneasy partnership, forever in danger or erupting in violence. Italian director Sergio Leone would mine this same territory in his series of movies with Clint Eastwood (as would Sam Peckinpah in The Wild Bunch). Like Eastwood's man-with-no-name who was capable of near superhuman prowess, Lancaster and Cooper are no mere mortals. Lancaster in particular, always grinning like a Cheshire cat, is always ready for whatever hardship gets thrown his way. Even when he's surrounded by hundreds of peasant revolutionaries, Joe Erin (Lancaster) finds a way out. He continually escapes desperate situations--like a cat with nine lives. Cooper plays a loner named Benjamin Trane. He rides into Mexico on a strictly mercenary mission, hoping to sign up with either Emperor Maximilian or revolutionary Juarez--whoever will pay him the most. His morality is tied to money. "Money. Is that worth risking your life for?" a Juarista general asks Trane. "Comes closer than anything I know." "Man's got to have more. Needs something to believe in." "I've got that too," says Trane as he holds up his rifle and gives it a shake. With this preoccupation over greed and treachery ("Gold belongs to the man that gets it," says Trane), Vera Cruz paves the way for a new type of Western, where the standard morality of traditional Westerns would begin to look positively old-fashioned. However, the story hints that Cooper's Ben Trane is capable of becoming a good man. In fact, Trane is a Southern landowner who saw his riches reduced to ashes during the Civil War. He needs money so he can start a new life. Meanwhile, Lancaster's Joe Erin is a career outlaw who enjoys his lifestyle. Director Robert Aldrich was particularly fond of Vera Cruz. He described Ben Trane as the hero and Joe Erin as the antihero: "I like this one, and it again had a hero and an antihero, whom he admired in spite of their separate credos," he said. In the mid '50s, director Robert Aldrich was one of the most interesting directors working in Hollywood. In quick succession, he turned out such influential movies as Kiss Me Deadly, Attack, and Apache. Stylistically his films tend to exaggerate emotions to near hysterical proportions. Samuel Fuller and Nicholas Ray also tread this territory (look no further than Forty Guns and Johnny Guitar, respectively, for examples). While the hero of a John Ford Western would almost always remain taciturn and in control (think of John Wayne in Stagecoach or Henry Fonda in My Darling Clementine), the heroes in the films of Aldrich, Fuller, and Ray would be just as prone to emotional outbursts as they would to gun play. In Vera Cruz, Aldrich doesn't spare us any gun play; however, the emphasis remains upon the one-upmanship as Lancaster and Cooper delight in taking advantage of each other, like two spiteful-but-appreciative lovers who know all their partners' foibles and weaknesses.